Easy Dulce de Leche Cheesecake recipe makes a rich, caramel flavored cheesecake. If you have never tried a dulce de leche cheesecake, you are in for a treat. This easy cheese cake recipe uses a can of dulce de leche which is basically the best tasting caramel in a can. It is thick and light to dark brown in color. Dulce de leche can generally be found in the international food section of the grocery store. Serve it to your friends and hear them say Ooooh! What's that? In a small bowl, mix graham cracker crumbs, butter and 2 tablespoons sugar. Firmly press onto bottom of a 9-inch springform pan. In a large bowl, with mixer on medium speed, beat cream cheese and 3/4 cup sugar until well blended. Add sour cream and mix well. Add eggs, one at a time, mixing on low speed after each addition, just until blended. 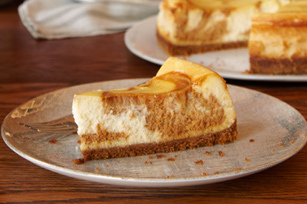 Remove 1-1/4 cups cheesecake batter and mix with dulce de leche. Pour remaining batter over crust. Drop spoonfuls of dulce de leche mixture over batter. Gently swirl batter with a knife. Bake for 1 hour and 15 minutes, or until center of cheesecake is almost set. Remove from oven and let cool. When pan is cool enough to handle, run a knife around the sides of the pan to loosen cheesecake. Cool to room temperature before removing rim. Cover and refrigerate for at least 4 hours.